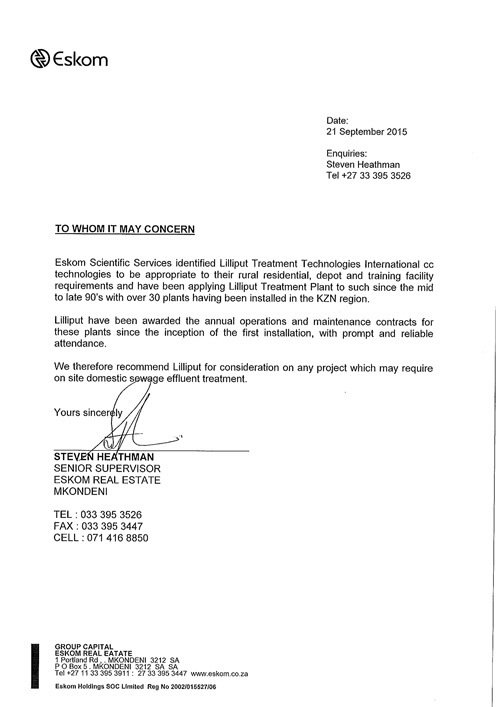 Eskom Scientific Services identified Lilliput Treatment Technologies International cc technologies to be appropriate to their rural residential, depot and training facility requirements and have been applying Lilliput Treatment Plant to such since the mid to late 90’s with over 30 plants having been installed in the KZN region. Lilliput have been awarded the annual operations and maintenance contracts for these plants since the inception of the first installation, with prompt and reliable attendance. We therefore recommend Lilliput for consideration on any project which may require on site domestic sewage effluent treatment. Lilliput Technologies have been our supplier for more than 8 years. They supplied us with almost 250 complete waste water sewerage systems. The product has proved to be simple, efficient and cost effective to help combat the water crisis in our province – Limpopo. During the time we have been doing business with Lilliput Technologies, they have always been professional and supportive. Deliveries are prompt and complete. Any information regarding these systems is freely available from them. 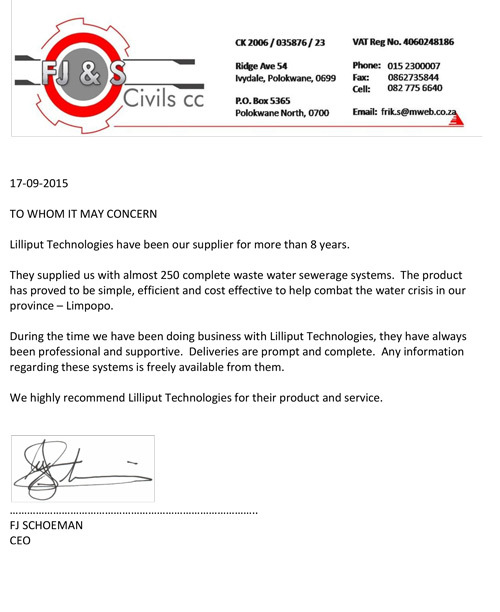 We highly recommend Lilliput Technologies for their product and service. 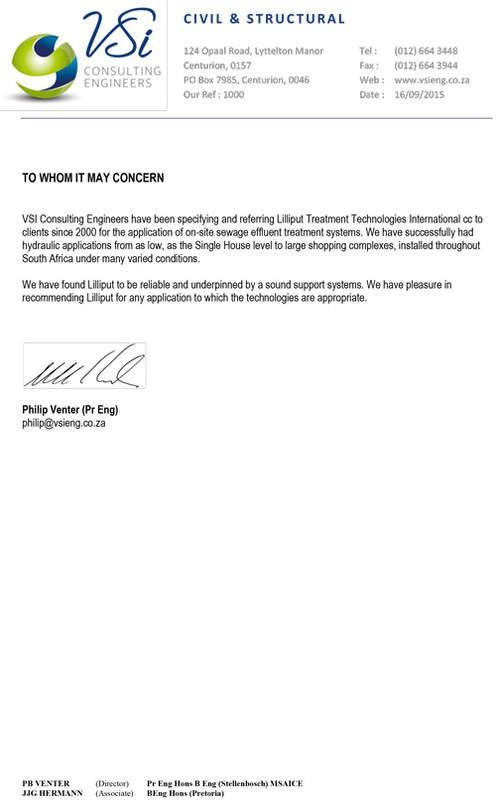 VSI Consulting Engineers have been specifying and referring Lilliput Treatment Technologies International cc to clients since 2000 for the application of on-site sewage effluent treatment systems. We have successfully had hydraulic applications from as low, as the Single House level to large shopping complexes, installed throughout South Africa under many varied conditions. We have found Lilliput to be reliable and underpinned by a sound support systems. We have pleasure in recommending Lilliput for any application to which the technologies are appropriate.